Come and enjoy paradise in this beautiful 3 bedroom/3 bath home in Seapines located in Carolina Place near the Seapines preserve. This home is newly renovated, and decorated. Bathrooms feature designer ceramic with granite countertops and double sinks in each bathroom. All new paint and furnishings throughout. 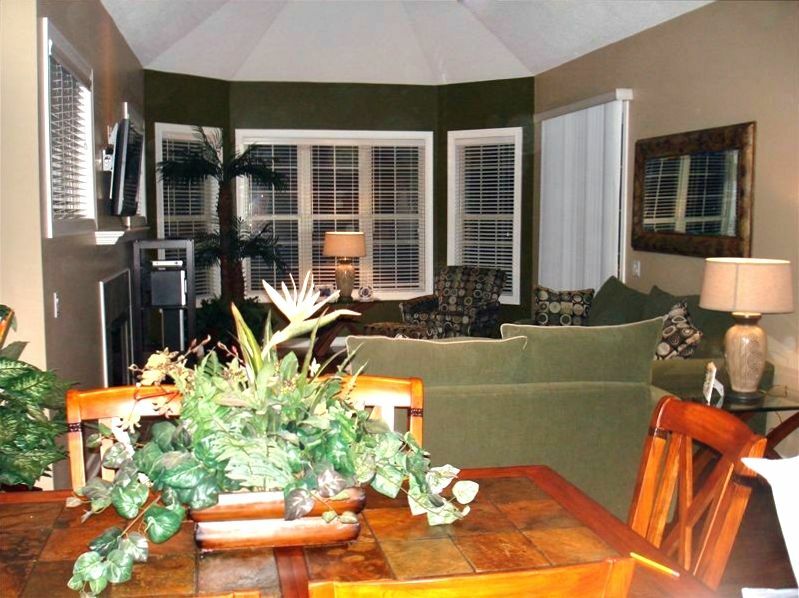 This home features 2 master bedrooms, high-speed wireless access and two large plasma TV's. This 3 bedroom 3 bathroom vacation rental house is in a spectacular location within biking distance of the beach, Harbor Town and South Beach. Bike trails throughout all of Seapines makes easy to get around and enjoy the outdoors at all the popular spots. You will have free access to a pool and tennis courts within a short walk. Carolina Place has a large community pool with a covered picnic area, hot tub, and tennis courts for our guests to enjoy. This home features hardwood floors, a tiled kitchen and a large living room area. Upon entering the home, you are greeted by vaulted ceilings in the living room and dining area. Located off the main entrance is the spacious kitchen and breakfast area. You have access to the back deck from the living room and first master bedroom. The deck features a beautiful view of the lagoon. The first master bedroom is furnished with a king bed, television, and French doors leading into a large master bath featuring a Jacuzzi tub, a separate water closet and a walk in shower. The second master is furnished with a queen size bed, television and the bath has a tub/shower combo and double sinks. The third bedroom is furnished with 2 sets of bunk beds. Each bunk bed features a full size bed on the bottom and a twin bed on the top. Bathroom access is just across the hall with double sinks and a tub/shower combo. Don't miss this opportunity to enjoy a little of paradise. Our home will be put on the market for sale in mid April. The Home is required to be available and presentable for the real estate agent to show the home with a12- 24 hour notice. We enjoyed our stay in Hilton Head at the Larmore's. The house was the perfect size for the 6 of us and beautifully kept. Thank you, we look forward to returning. Thank your for the Kerry kind remarks. We are so happy to hear you enjoyed your stay in our home and enjoyed the beautiful Hilton head island. We look forward to having you return on your next visit to the island! We are enjoyed our week in Hilton Head in this beautiful home. We had plenty of room. Loved that the two guest rooms were on there own hallway with having teenagers there was privacy for all. Loved having the garage to store bikes, beach chairs, umbrellas, and keeping a car in. Home was clean, and loved having the grill to fix dinners. Owner responded quickly and answered are questions. We are very happy you enjoyed your visit to our home. We look forward to having you back again on your next visit to the Island. This house was a great fit for our family and our friends that joined us. The kids loved the bunk room! It was clean and delivered on everything promised. We really enjoyed having access to the tennis courts and pool- we even grilled out lunch there. We are so happy you enjoyed your visit and met all your expectations! We look forward to your next visit. Home is spacious and well equipped with all necessary needs. Very clean and well maintained. This house is great. Perfect for two families as we had four adults and four kids ages 11-16. It is very clean and spacious with all the amenities of home. It was also nice to have a garage to put the car and bikes in. The pool is with within walking distance and the bike ride to the beach is a solid 15 minutes if you cut through the nature reserve. Overall, we enjoyed our stay here and preferred it to other townhouses we have stayed in. Registration and pass pick up was easy as well. Highly recommend. We were several adults and 3 children. I loved the layout of the house because the master was away from the other "wing" where the other bedrooms and bathrooms were. That made it more private for me. The living area was spacious and the keyless entry is such a smart way to go. Although I don't know what we would have done if there had been a power failure. However, the owner was prompt to reply on email to the few questions I had after arriving. The kitchen was well stocked with glasses and plates to accommodate 10 people and that was a pleasant change. While we made it work, the third bedroom is supposed to sleep 6. That's tough, even if there are multiple children. The sexes and age differences made this something we had to work through. Otherwise, it's a great location with a short ride to feed the horses at Lawton Stables and a couple of mile bike ride each way to harbor town. The Carolina Place pool is clean, convenient and the gas grills came in handy when we cooked dinner up there one night. We could have done that at the house because there is a grill on the deck overlooking the lagoon but who wants to leave the pool early? The proximity to Greenwood Gate makes going to the grocery store or out to explore the rest of the island quick and easy. Lastly, having a garage allowed us to put the bikes in at night and keep all the beach accessories in one place, while allowing us to still park one of the cars inside. 1. Online orders can be placed at aaaridingtigers.com or hiltonheadbikes.com, once you are on our homepage for either site, simply click the orange ‘BOOK NOW’ button at the top right of the page- this directs you to our secure ordering portal, step 1 is to enter your dates & email, follow the prompts from there, select rental items, and enter the promo code (OWNER10) in the coupon code box before checking out to receive 10% OFF the entire order. 4. We will honor the OWNER10 promo code for both online orders and call-in orders alike.